Starting at the Kahului Airport there are various routes to get to Kihei Kai, each around a 9 mile, or 20 minute drive. Exit the airport keep left toward Keolani Place (Passing Krispy Kreme on your right and Costco on your left). Continue straight through the traffic light and make a left onto Hana Highway just passed KMart. 1. Your first right off of Hana Highway will take you onto Dairy Road. You will drive past Walmart and turn left onto Puunene Ave at the intersection with a large blue church on the left. 2. Your second right off of Hana Highway will take you onto Ho’okele Street where you will drive in front of Target on the left. At the end of the road, you will turn left onto Puunene Ave.
After turning left onto Puunene Ave (also known as HI-311 South / Mokulele Hwy) you will travel 6 miles until you reach the intersection with North Kihei Road. Make an immediate right next to “Beach Access” sign. 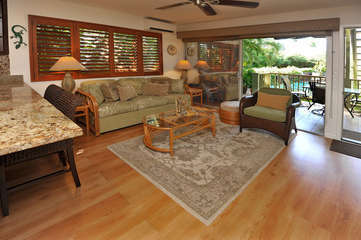 This will lead you into a side road access to several ocean front properties, including Kihei Kai.